Waikoloa Beach Resort presents the 13th Annual Great Waikoloa Ukulele Festival at Queens’ MarketPlace. Starting with a free ukulele workshop with Roy Sakuma, the celebration of Hawaii’s favorite musical instrument includes nonstop entertainment from 12 to 7 p.m. Saturday, March 2, with a special appearance by multiple Na Hoku Hanohano Award-winner Sean Naauao. With Hawaii’s “Ambassador of Aloha” Danny Kaleikini as Master of Ceremonies, the Ukulele Festival spotlights 13 performances on two stages, and lots of giveaways. Lei-making, umeke making (decorated gourd bowl), ukulele making demonstrations and ukulele lessons will be offered throughout the afternoon. 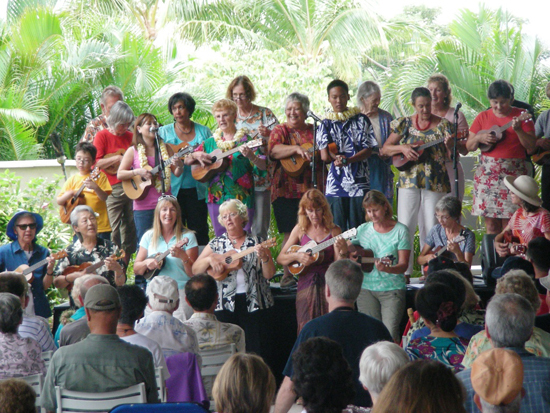 Roy and wife Kathy created the first annual Ukulele Festival in 1971, while Roy was a maintenance worker for the City and County of Honolulu. Today, their efforts have grown into a series of events on four islands, with more than 20,000 participants. Appearing with Roy at the ‘Ukulele Festival will be his mentor for more than 50 years, Herb “Ohta-san” Ohta, jazz guitarist Nando Suan, and his protegee Nelly Toyama-Baduria. Sponsors include Waikoloa Beach Resort, Queens’ MarketPlace, Ukulele Festival Hawaii, Roberts Hawaii, ukulele companies: MGM Ukulele, KALA, Kamaka Ukulele, Kanilea Ukulele, KoAloha and Koolau Pono Guitar & Ukulele Company. Ukulele Workshop with Roy and Kathy Sakuma. BYOU (bring your own ukulele). Free.